Periodically throughout history, a famous scientist steps forward to proclaim “the end of scientific discovery.” This statement reflects the belief of many scientists at the time that no dramatically new progress is possible because the current scientific knowledge is essentially complete. From their perspective, all that remains is to fill in the minor details, and everything will be fully understood. Often the element that changes this mindset is the advent of new equipment or new methods of investigation. This book describes a remarkable new discovery that arose from the use of new, highly-sensitive, automated-weighing technology. 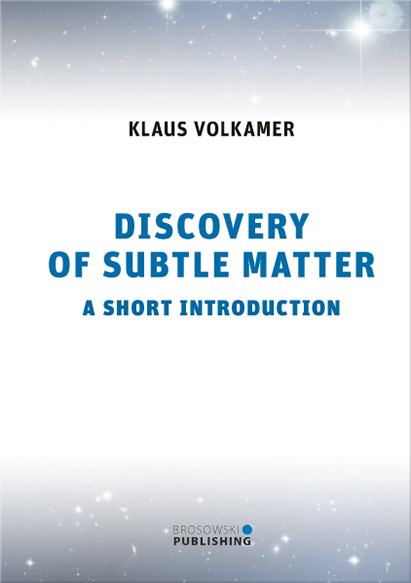 As a result of extensive studies of anomalous weight changes in certain systems, both living and non-living, Dr. Volkamer has arrived at a theoretical explanation involving two previously unknown forms of matter, both invisible to the eye. One form of this matter is assigned a positive physical sign, and is an excellent candidate to explain dark matter. The other form is is given a negative sign, yielding an explanation of dark energy. The detected quanta of subtle matter can “bind to” ordinary matter to influence weight in opposite directions. The two forms show other distinguishing characteristics. For example, one form appears to support life while the other has negative effects on living systems. Further studies appear to show that control of their interactions with ordinary matter may have remarkable benefits for mankind. „…My strong dedication to the work described here stems from the feeling that something is missing in the present scientific understanding of the world. Our objective approach to explaining the universe, even though successful at dealing with matter on a practical level, missed, for example, a satisfactory explanation of human subjectivity and of life in general. The hope of modern science in the West has been to explain the phenomena of creation and of life in purely material terms, but this desire often appears to be at odds with Eastern approaches to the topic. From this conflict, the impetus arose in me to look for an extension of modern science, using its own approved methods, so that a sustainable bridge could be built between the Western objective sciences of matter and the Eastern traditional sciences of life. Surprisingly, my first weighing tests, which were conducted in 1984 using a manually operated balance, a small geometrically shaped detector, and a folded reference system, yielded significant gravitational anomalies. The mass of the detector appeared to change over time. If this change proved to be real, it would demonstrate a violation of the law of conservation of mass, one of the fundamental concepts of modern physics.